Sacred Citadel is out NOW! I know it's not Sacred 3, but after we played a little bit of the beat'em up I can say it's more than a pleasant distraction. The combat seemed a little dull for the first few minutes, but then we quickly unlocked some combos that added depth to the beat downs. Each character can wield a variety of weapons. Beat up your orcish enemies until you've built up a power move. Then the fun begins for you and they dying starts for them. There's a fair amount of loot to collect, and characters can earn experience and increase a few stats to become a more efficient warrior. I really felt like I was playing a good old-school arcade game. Golden Axe fans should check it out. And if you never played a Golden Axe game you should definitely check it out. Make sure you play with friends. 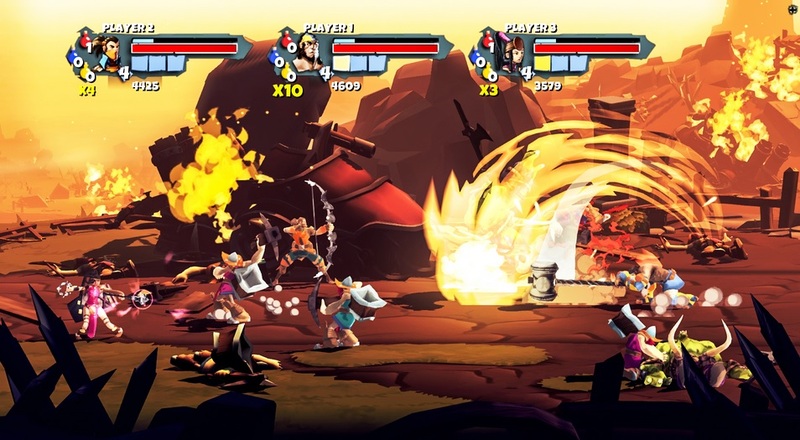 Sacred Citadel supports three player local co-op and three player online co-op. It's available for download now from the PlayStation Store and Steam. It should be available tomorrow from the Xbox Live Marketplace. It's priced at 1200 MSP or $15.